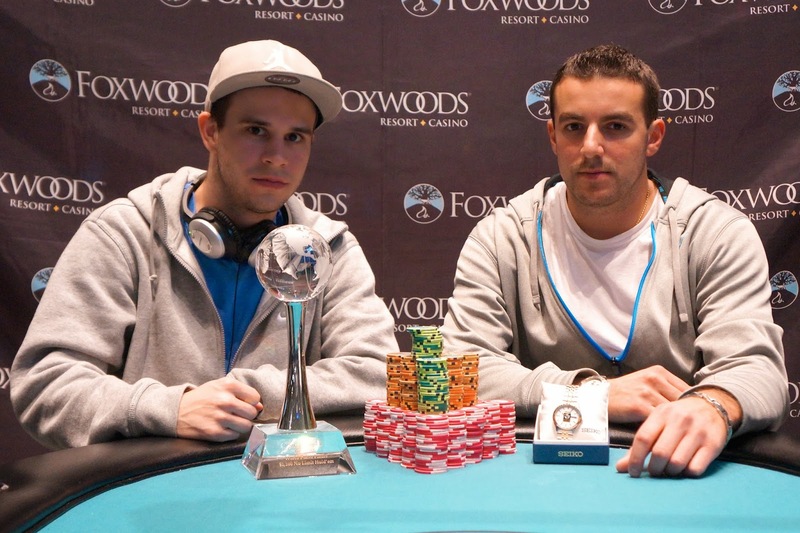 Brad St. Vincent and Chris Korres have come to an agreement on a heads-up chip chop, making them co-champions of the $1,100 No-Limit Hold 'em Event #16 at the Foxwoods World Poker Finals. 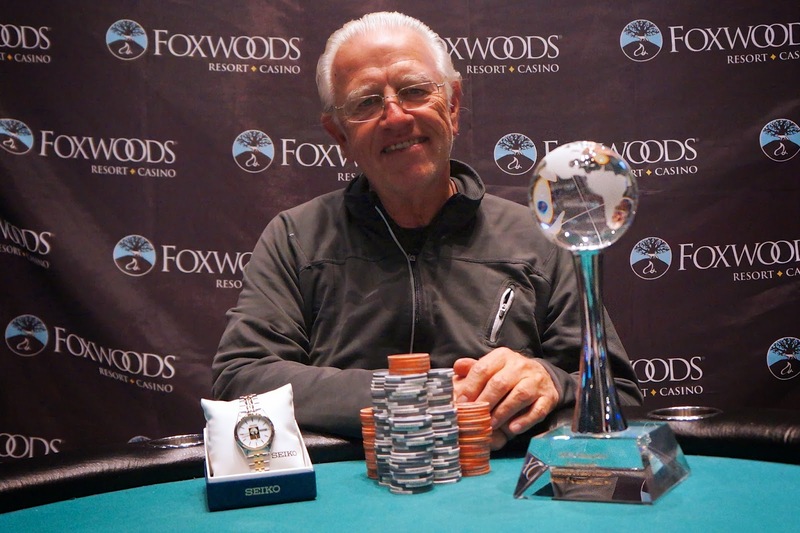 St. Vincent takes home $28,500 and the World Poker Finals trophy while Korres pockets $25,428 and the World Poker Finals watch. 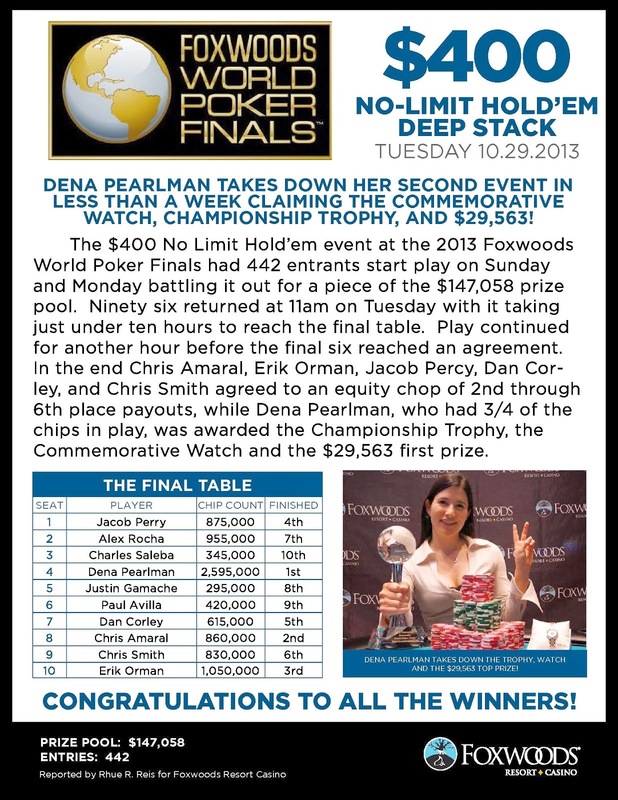 $2,700 No-Limit $500K GTD World Poker Finals Main Event Kicks Off Tomorrow! The $2,700 No-Limit Hold 'em Foxwoods World Poker Finals Main Event kicks off at noon on Friday. 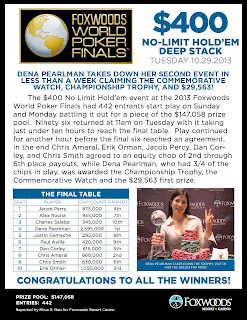 Players start with 30,000 in chips and all levels are one-hour in length. Re-entries are available through the end of registration. Registration will remain open until the end of Level 9 (the first level of play on Day 2). 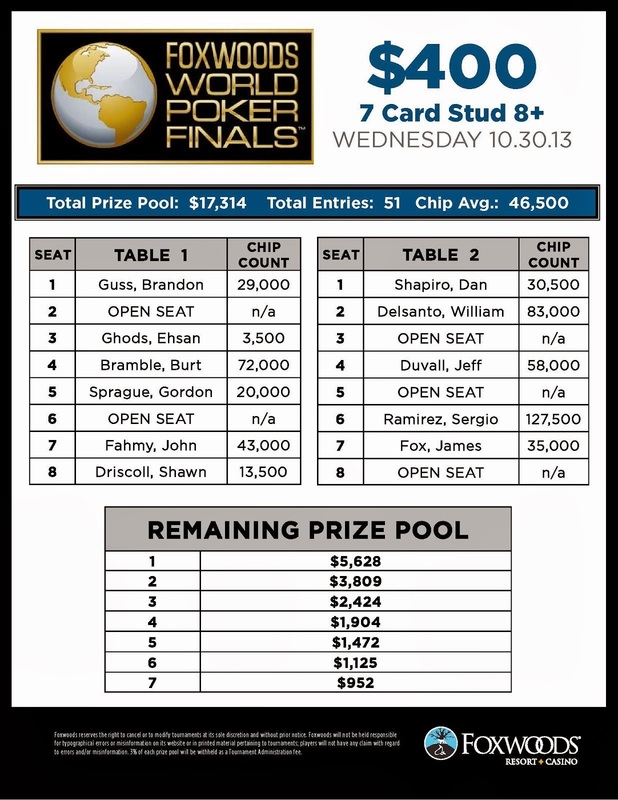 Days 1 and 2 will will last eight levels while Day 3 will consist of eight levels or the final table, whichever comes first. 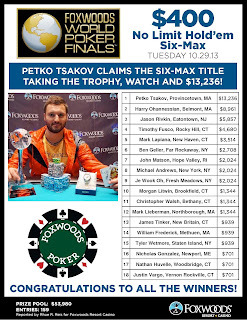 The Main Event features a $500,000 guaranteed prize pool. 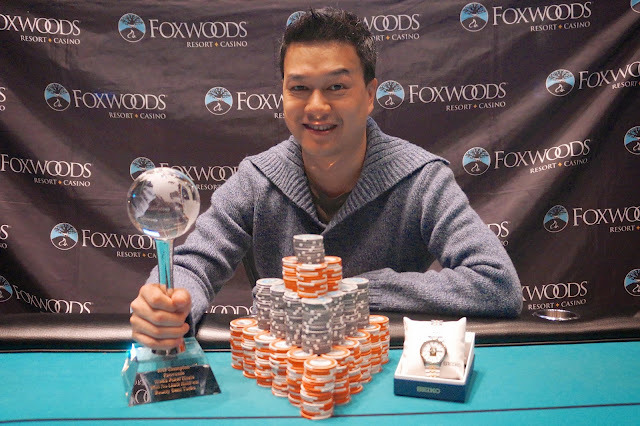 Congratulations to She Lok Wong, official winner of the $500 No-Limit Hold 'em Bounty Turbo Event #18 at the Foxwoods World Poker Finals. 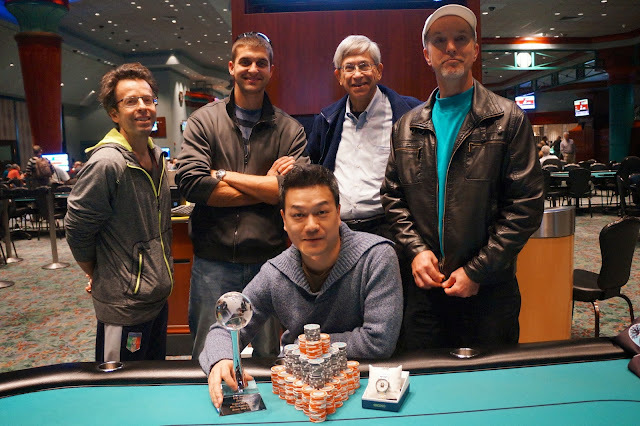 After a five-way chop, Wong takes home $4,020 as well as the World Poker Finals trophy and watch. Jeffrey Duvall Wins the $400 7-Card Stud Hi/Lo Event at the Foxwoods World Poker Finals! 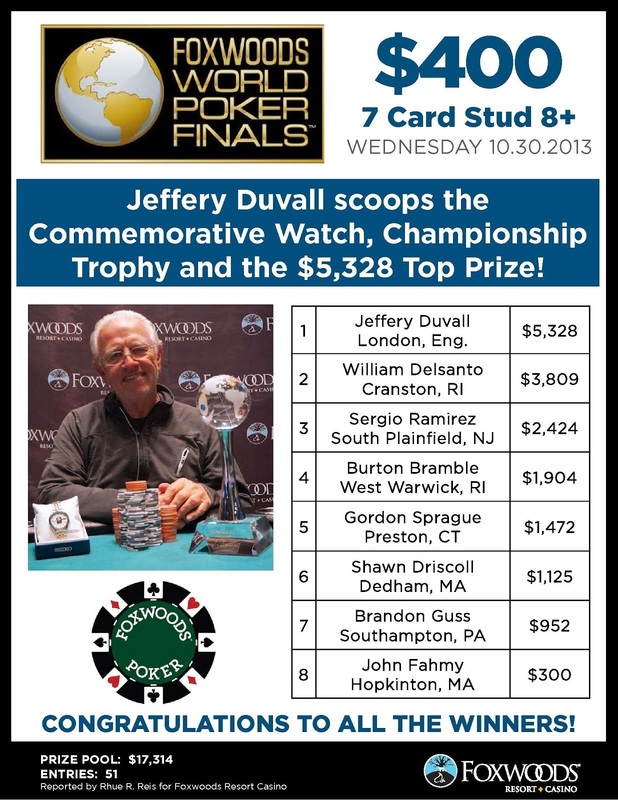 Congratulations to Jeffrey Duvall, winner of the $400 7-Card Stud Hi/Lo Event #17 at the Foxwoods World Poker Finals. 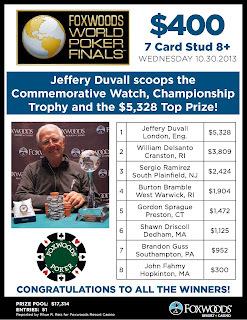 Duvall takes home $5,328 as well as the World Poker Finals trophy and watch. Rob Brown, Will Failla and Tim Reilly find themselves seated together during one of today's Main Event satellites at the Foxwoods World Poker Finals. 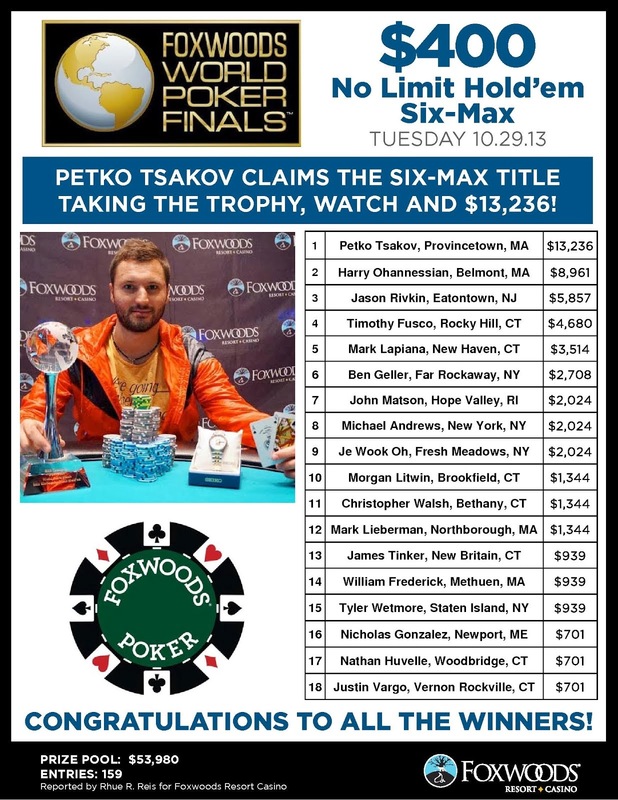 We have reached the final table of the $1,100 No-Limit Hold 'em Event #16 at the Foxwoods World Poker Finals. The blinds are currently 2,000-5,000 with a 500 ante. You can watch the live stream of the final table by clicking on FoxwoodsLive.com. We had a total of 75 entrants in Event #18, the $400 No-Limit Hold 'em Bounty Turbo, at the Foxwoods World Poker Finals. 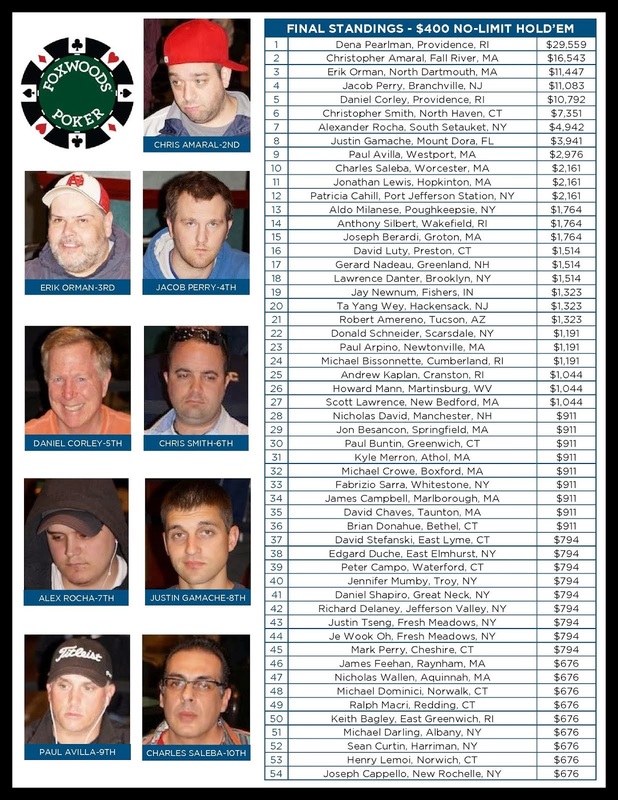 The final 9 spots will finish in the money with first taking home $7,353. 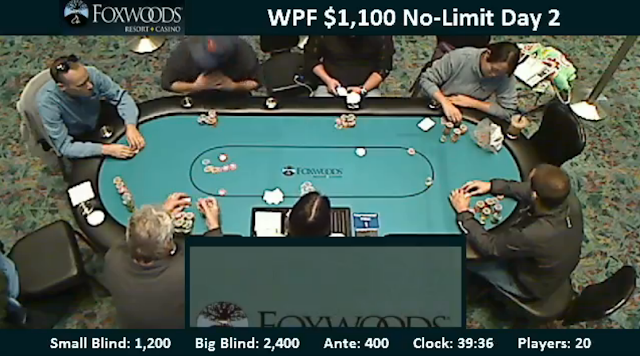 $1,100 No-Limit Hold 'em Day 2 Now Streaming Live! 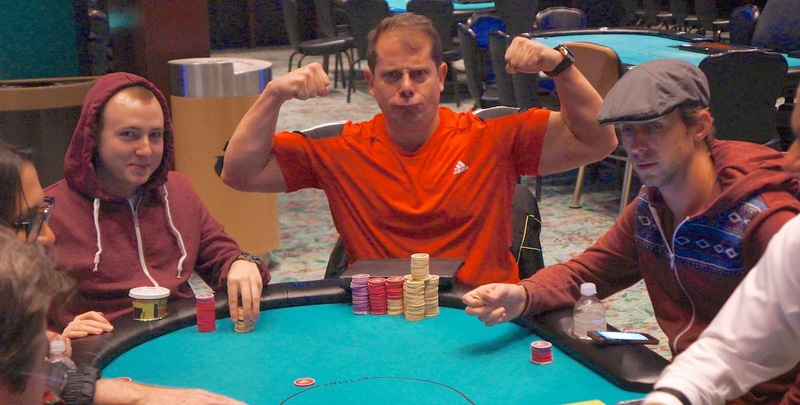 Play has resumed on Day 2 of the $1,100 No-Limit Hold 'em Event #16. The final 20 players have taken their seats and cards are in the air. 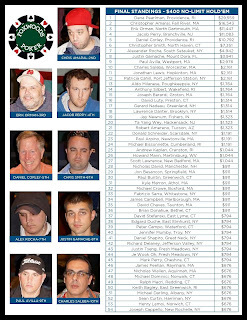 You can view the full Day 2 starting chip counts by clicking here.